North Korea–United States relations refers to international relations between North Korea and the United States. The political and diplomatic relations between North Korea and the United States have been historically hostile, developing primarily during the Korean War. In recent years relations have been largely defined by North Korea's nuclear program – six tests of nuclear weapons, its development of long-range missiles capable of striking targets thousands of miles away, and its ongoing threats to strike the United States and South Korea with nuclear weapons and conventional forces. During his presidency, George W. Bush referred to North Korea as part of "the Axis of Evil" because of the threat of its nuclear capabilities. North Korean Leader Kim Jong-un (left) and U.S. President Donald Trump (right), June 2018. Recently, North Korea and the United States of America have started some formal diplomacy after the first Trump-Kim Summit in 2018. Sweden acts as the protecting power of United States interests in North Korea for consular matters. Since the Korean War, the United States has maintained a strong military presence in South Korea. However, the United States has considered, de jure, South Korea as the sole legitimate representative of all of Korea. Support among the American public for US forces to defend South Korea has increased steadily. While it was at a mere 26% in 1990, it has now nearly tripled to 62%. A majority of the American public also have a positive view of Moon Jae-in, the South Korean President as of 2017. In 2015, according to Gallup's annual World Affairs survey, only 9% of Americans have a favorable view of North Korea, while 87% of Americans have a negative view. According to a 2014 BBC World Service Poll, only 4% of Americans view North Korea's influence positively with 90% expressing a negative view, one of the most negative perceptions of North Korea in the world. 2017 marked a significant rise of tensions and amplified rhetoric from both sides as Donald Trump took the presidency, after it appeared that North Korea's nuclear weapons program was developing at a faster rate than previously thought. The increasing rhetoric (as well as Trump's more aggressive approach to handling North Korea), missile testing and increasing military presence on the Korean Peninsula sparked speculation of a nuclear conflict. Despite fears of a massive conflict, a détente began to develop when on March 8, 2018, the White House confirmed that Trump would accept a meeting invitation from Kim Jong-un. At the time, they were supposed to meet in May. On May 15, 2018, North Korea cut off talks with South Korea and threatened to cancel the planned U.S.-North Korea summit, citing military exercises between the United States and South Korea. This cancellation was quickly reversed when Trump received an uncharacteristically friendly reply from Kim. On June 12, 2018, Trump and Kim met at the summit in Singapore, in the first summit meeting between the leaders of the two countries. Over the course of the summit, the two leaders engaged in several discussions and signed a joint statement calling for security, stability, and lasting peace. On February 22, 2019 an armed commando assaulted the North Korean embassy in Madrid, Spain; two of the members were later identified as CIA operatives. A second summit between Trump and Kim occurred on February 27 and 28, 2019 in Vietnam regarding North Korea's nuclear program, but ended abruptly without an agreement. Although hostility between the two countries remains largely a product of Cold War politics, there were earlier conflicts and animosity between the U.S. and Korea. In the mid-19th century Korea closed its border to Western trade. In the General Sherman incident, which took place in 1866, Korean forces attacked a U.S. gunboat sent to negotiate a trade treaty and killed its crew, after fire from both sides because it defied instructions from Korean officials. A U.S. retribution attack, the Shinmiyangyo, followed. Korea and the U.S. ultimately established trade relations in 1882. Relations soured again in 1905 when the U.S. negotiated peace at the end of the Russo-Japanese War. Japan persuaded the U.S. to accept Korea as part of Japan's sphere of influence, and the United States did not protest when Japan annexed Korea five years later. Korean nationalists unsuccessfully petitioned the United States to support their cause at the Versailles Treaty conference under Woodrow Wilson's principle of national self-determination. The United Nations divided Korea after World War II along the 38th parallel, intending this as a temporary measure. However, the breakdown of relations between the U.S. and USSR prevented a reunification. During the U.S. army's occupation of South Korea, relations between the U.S. and North Korea were conducted through the Soviet military government in the North. Because of North Korea's "submission" to Soviet pressures, and because of mass opposition to the U.S. occupation of the mortal enemy Japan, North Koreans in this period denounced the United States and began to form a negative view of the U.S. However, several American ministers and missionaries remained active in this period. On September 9, 1948, Kim Il-sung declared the Democratic People's Republic of Korea; he promptly received diplomatic recognition from the Soviet Union, but not the United States. The U.S. did not extend, and has never extended, diplomatic recognition to the DPRK. Kim Il-Sung's anti-American rhetoric often asserted that the U.S. was a capitalist imperialist successor to Japan, a view the country still holds today. In December 1950, the United States initiated economic sanctions against the DPRK under the Trading with the Enemy Act, which lasted until 2008. North Koreans had their closest encounter with the United States during the US/UN occupation of North Korea in the two months after the Inchon landing. With help from the ROK Army, the United States' military, under the command of General Douglas MacArthur, moved to set up a civil administration for North Korea in the wake of the presumed defeat of North Korea. MacArthur planned to find North Korean generals, especially Kim Il-Sung, and try them as war criminals. In the early 1960s, several American soldiers defected to North Korea. Only one defector, Charles Jenkins, returned to the U.S. and faced a U.S. military court, pleading guilty to charges of desertion and aiding the enemy. Jerry Parrish, Larry Abshier and James Dresnok died of natural causes in North Korea. Some leafleting of North Korea was resumed after the heavy leafleting that took place in the Korean War, such Operation Jilli from 1964 to 1968. One leaflet was on one side a good reproduction of a North Korean one won note, about six weeks' pay for an ordinary North Korean soldier, and on the other a safe conduct pass for defection to the south. The rationale was to allow soldiers to easily hide the pass, but the quality was sufficient for it to gain some use as a fraudulent banknote in North Korea. On January 23, 1968, a U.S. spy ship was captured. The incident was known as the Pueblo incident. On April 15, 1969, EC-121 was shot down over the Sea of Japan by North Korea; 31 American service men died. 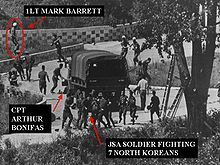 On August 18, 1976, Captain Arthur Bonifas and Lieutenant Mark Barrett were killed by the North Korean Army with axes at Panmunjom in the Korean Demilitarized Zone, when the Americans were engaged in routine tree-clearing. The attack coincided with a meeting of the Conference of Non-Aligned Nations in Colombo, Sri Lanka, at which Kim Jong-il, the son of North Korean leader Kim Il-sung, presented the incident as an example of American aggression, helping secure the passage of a motion calling for a U.S. withdrawal from the South. The Ford administration decided that it was necessary to respond with a major show of force. The North Korean government backed down and allowed the tree-cutting to go ahead, and later issued an unprecedented official apology. North Korea and the United States had little to no relations during this time, except through the structures created by the Korean Armistice Agreement. In 1994, North Korea blocked international inspectors from verifying the regime's adherence to the Nuclear Nonproliferation Treaty. The Bill Clinton administration believed that the North Koreans were processing plutonium from a reactor to build two atomic bombs. President Clinton recalled that "I was determined to prevent North Korea from developing a nuclear arsenal, even at the risk of war". Declassified Clinton-era documents illustrate that the administration had planned for a possible war during the 1994 nuclear crisis. According to former Pentagon officials, the Clinton administration drew plans to strike the North Korea nuclear reactor at Yongbyon. In December 1994 a US OH-58 Kiowa helicopter was shot down over North Korea, a pilot died and another was captured by North Korea and held for 13 days. In December 2002, Spanish troops boarded and detained a shipment of Scud missiles from North Korea destined for Yemen, at the United States' request. After two days, the United States released the ship to continue its shipment to Yemen. This further strained the relationship between the US and North Korea, with North Korea characterizing the boarding an "act of piracy". In September 2005, immediately following the September 19 agreement, relations between the countries were further strained by US allegations of North Korean counterfeiting of American dollars. The US alleges that North Korea produces $15 million worth of supernotes every year, and has induced banks in Macau and elsewhere to end business with North Korea. In 2007, an audit by Ernst & Young found no evidence that the banks had facilitated North Korean money-laundering. At various times during the Bush administration Dong Moon Joo, the president of The Washington Times, undertook unofficial diplomatic missions to North Korea in an effort to improve relations. On February 13, 2007, agreement in the Six-Party Talks – among the United States, the two Koreas, Japan, China, and Russia – called for other actions besides a path toward a denuclearized Korean peninsula. It also outlined steps toward the normalization of political relations with Pyongyang, a replacement of the Korean Armistice Agreement with a peace treaty, and the building of a regional peace structure for Northeast Asia. In exchange for substantial fuel aid, North Korea agreed to shut down the Yongbyon nuclear facility. The United States also agreed to begin discussions on normalization of relations with North Korea, and to begin the process of removing North Korea from its list of state sponsors of terrorism. Implementation of this agreement has been successful so far, with US Chief Negotiator Christopher R. Hill saying North Korea has adhered to its commitments. The sixth round of talks commencing on March 19, 2007, discussed the future of the North Korean nuclear weapons program. In early June 2008, the United States agreed to start lifting restrictions after North Korea began the disarming process. President Bush announced he would remove North Korea from the list of state sponsors of terrorism after North Korea released a 60-page declaration of its nuclear activities. Shortly thereafter North Korean officials released video of the demolition of the nuclear reactor at Yongbyon, considered a symbol of North Korea's nuclear program. The Bush administration praised the progress, but was criticized by many, including some within the administration, for settling for too little. The document released said nothing about alleged uranium enrichment programs or nuclear proliferation to other countries. The United States public has historically favored diplomatic approaches over military ones in regards to North Korea. Framing of the North Korean conflict is what is widely believed to have led to such widespread support for a diplomatic approach among the American people. The U.S. Navy rescued the Dai Hong Dan crew from Somali pirates. 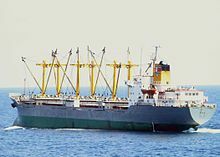 On November 4, 2007, Dai Hong Dan, a North Korean merchant vessel, was attacked by Somali pirates off the coast of Mogadishu who forced their way aboard, posing as guards. As U.S. Navy ships patrolling the waters moved to respond, the 22 North Korean seamen fought the eight Somali pirates in hand-to-hand combat. With aid from the crew of the USS James E. Williams and a helicopter, the ship was freed, and permission was given to the U.S. crew to treat the wounded crew and pirates. This resulted in favorable comments from U.S. envoy in Beijing, Christopher R. Hill, as well as an exceedingly rare pro-U.S. statement in the North Korean press. The favorable result of the incident occurred at an important moment, as the North Koreans moved to implement the February 13 agreement with the acquiescence of the Bush Administration, and the 2007 South Korean presidential election loomed, with the North Koreans taking pains to emphasize a more moderate policy. In February 2008, the New York Philharmonic visited North Korea. The concert was broadcast on North Korean television. American-North Korean relations have further been strained by the arrest of two American journalists on March 17, 2009. The two journalists, Euna Lee and Laura Ling of Current TV, were arrested on the North Korean border in China while supposedly filming a documentary on the trafficking of women and allegedly crossing into North Korea in the process. North Korea subsequently tried the two journalists amid international protests and found them guilty of the charges, and sentenced them to twelve years of hard labor. The U.S. criticized the act as a "sham trial". The ordeal was finally resolved on August 4, when former President Bill Clinton arrived in Pyongyang in what he described as a "solely private mission" to secure the release of the two American journalists. He reportedly forwarded a message to North Korean leader Kim Jong-il from then-U.S. President Barack Obama, but White House Press Secretary Robert Gibbs denied this claim. Clinton's discussions with Kim were reportedly on various issues regarding American-North Korean relations. On August 5, Kim issued a formal pardon to the two American journalists, who subsequently returned to Los Angeles with Clinton. The unannounced visit by Clinton was the first by a high-profile American official since 2000, and is reported to have drawn praise and understanding by the parties involved. On May 24, 2010, the United States set plans to participate in new military exercises with South Korea as a direct military response to the sinking of a South Korean warship by what officials called a North Korean torpedo. On May 28, 2010, the official (North) Korean Central News Agency stated that "it is the United States that is behind the case of 'Cheonan.' The investigation was steered by the U.S. from its very outset." It also accused the United States of manipulating the investigation and named the administration of U.S. President Barack Obama directly of using the case for "escalating instability in the Asia-Pacific region, containing big powers and emerging unchallenged in the region." The report indicated to the United States to "behave itself, mindful of the grave consequences." In July 2010, the DPRK government indefinitely postponed a scheduled talk at Panmunjom relating to the sinking. The meeting was intended as preparation for future talks at higher governmental levels. Just over two years later on March 16, 2012, North Korea announced it would launch its Kwangmyŏngsŏng-3 satellite to mark the 100th anniversary of the late Kim Il-sung's birthday. This announcement triggered American anxiety as satellite launches are technologically contiguous with missile launches. This tampered with Kim Jong-un's earlier optimistic overtures and generated speculation on the issues confronting the new and young leader back in North Korea. The United States also suspended food aid to North Korea in retaliation for the missile plans. Daniel Russel, Special Assistant to the President and Senior Director of Asia, and Sydney Seiler flew to Pyongyang from Guam in August 2012 and stayed there for two days. A South Korean diplomatic source said "apparently President Barack Obama, who was then bidding for a second term in office, secretly sent the officials to North Korea to minimize disruptions to the U.S. presidential election." Other analysts say, "Nobody can rule out that such direct dialogue between Washington and Pyongyang will continue in the future." However, on December 11, 2012, North Korea successfully launched a missile in contrast to its failure in March. The United States strongly condemned the action as it is widely believed that North Korea are developing long range ballistic missiles that would reach the west coast of the US. On March 29, 2013, Kim Jong-un threatened the United States by "declaring that rockets were ready to be fired at American bases in the Pacific." The declaration was in response to two B2 stealth bombers that flew over the Korean peninsula on the day before. After Jong-un's declaration, the Pentagon called for an advanced missile defense system to the western Pacific on April 3. United States Secretary of Defense, Chuck Hagel, said that North Korea posed "a real and clear danger" to not only the United States, but Japan and South Korea as well. The deployment of the battery to the US territory of Guam is the biggest demonstration yet that Washington regards the confrontation with North Korea as more worrying than similar crises of the past few years. It also suggested they are preparing for long standoff. While visiting Seoul, South Korea on April 12, 2013, United States Secretary of State, John Kerry, said "North Korea will not be accepted as a nuclear power", and that a missile launch by North Korea would be a "huge mistake". On April 18, 2013, North Korea issued conditions for which any talks would take place with Washington D.C. or Seoul. They included lifting United Nations sanctions and an end to United States-South Korean Military exercises. In March 2016, over 315,000 South Korean and U.S. soldiers participated in the largest military drills ever staged on the Korean Peninsula. On April 26, 2013, North Korea said it had arrested a U.S. citizen for committing an unspecified crime against the country. U.S. officials said that person was Kenneth Bae. On May 2, 2013, Bae was convicted of "hostile acts" and sentenced to 15 years of hard labor. The U.S. has called for his release but North Korea has rejected any possibility of allowing prominent Americans to visit the country to request his release. Dennis Rodman, who had previously visited North Korea and become friends with Kim Jong-un, tweeted a plea for Bae's release. Rodman has since said he will visit North Korea again in August and attempt to free Bae. On May 2, 2014, Pyongyang’s Korean Central News Agency (KCNA) released an article composed of four essays written by North Korean citizens. The content of the article carried heavy criticism and racist remarks towards U.S. President Barack Obama. Two American citizens were detained in North Korea in June 2014, accused of "hostile acts". On July 28, 2014, the United States House of Representatives voted to pass the North Korea Sanctions Enforcement Act of 2013 (H.R. 1771; 113th Congress), but it was never passed by the Senate. On August 20, 2014, during annual U.S.-South Korea military drills, a spokesman for the North Korean government referred to U.S. Secretary of State John Kerry as a "wolf donning the mask of sheep", the latest in an exchange of taunts between U.S., South Korean and North Korean government officials. In January 2015, U.S. President Barack Obama indicated that he believed that over time the North Korean government will collapse. On July 28, 2016, a North Korean top diplomat for U.S. affairs claimed that the United States crossed the "red line" for putting leader Kim Jong-un on its list of sanctioned individuals, which was perceived by officials as the United States declaring war. Following the April 7, 2017 U.S. missile strikes in Shayrat, Syria in response to the chemical attack, tensions had mounted as U.S. President Donald Trump weighed further military options against North Korea's ballistic missile program. In the second week of April 2017, global media outlets erroneously reported that the USS Carl Vinson supercarrier had been deployed to the Sea of Japan heading towards North Korea, as a result of confusion created by a "miscommunication" between the "Pentagon and the White House." A premature announcement on April 8 from the Navy led to a "glitch-ridden sequence of events". On April 17 North Korea’s deputy United Nations ambassador accused the United States of "turning the Korean peninsula into "the world’s biggest hotspot" and the North Korean government stated "its readiness to declare war on the United States if North Korean forces were to be attacked." President Trump called Mr Kim “Little Rocket Man” and a “sick puppy”, and promised that continued North Korean threats to America “will be met with fire and fury like the world has never seen”. President Trump has at times called diplomacy with the Kim regime “a waste of time”. In reality on April 18, the Carl Vinson and its escorts were 3,500 miles from Korea engaged in scheduled joint Royal Australian Navy exercises in the Indian Ocean. The Carl Vinson aircraft carrier had been in the South China Sea in 2015 and again in February 2017 on routine patrols. In late April 2017, Trump stated that "[t]here is a chance that we [the United States] could end up having a major, major conflict with North Korea". In July 2017, U.S. Secretary of State Rex Tillerson authorized a "Geographical Travel Restriction" which banned Americans from entering North Korea. On August 30, 2018, the ban was extended until August 31, 2019. An American citizen by the name of Tony Kim, also known by the Korean name of Kim Sang-duk, was detained while attempting to leave North Korea through Pyongyang International Airport. In January 2016, an American student, Otto Warmbier, was detained at Pyongyang International Airport after allegedly attempting to steal a propaganda banner from his hotel. He was traveling with a group of Americans, all of whom safely returned to America without any conflict, while he was stopped by security and searched. Security footage showed him allegedly going into a banned area in the hotel and ripping out the poster from the wall and putting it in his bag. He claims that he was following orders from his church to take something from North Korea back to the church. In March 2016, he was sentenced to 15 years of hard labor, but in June 2017 was released from North Korea, having suspiciously fallen into a coma-like state. He died a few days after being repatriated to the U.S. North Korea claimed that they had nothing to do with his death. The Chinese travel company that took Warmbier to North Korea as part of a tourist group has stated that it will no longer accept American citizens on its tours to prevent similar circumstances from happening. After Americans heard about Warmbier's death, 49% wanted the administration to act, while 35% did not. Of those Americans who wanted action to be taken, the most popular response was for the U.S. to tighten sanctions on North Korea, and the second most popular was a total travel ban between the two countries. United States military action was the least popular response. In August 2017, the Washington Post reported on a confidential assessment carried out by the U.S. Defense Intelligence Agency which suggested that North Korea had successfully developed nuclear warheads for missiles within reach of the US mainland. Reacting to the report President Trump stated that future threats would be "met with fire and fury and frankly power, the likes of which this world has never seen before." In response North Korea announced that it was examining an operational plan to strike areas around the U.S. territory of Guam in the Pacific, including the Andersen Air Force Base. Officials stated that Joseph Y. Yun, the US envoy for North Korea policy, and Pak Song-il, a senior North Korean diplomat at the country’s UN mission, were making regular contact during this dispute, through a conduit of communication they called the New York channel. On August 8, 2017, President Trump suggested that the United States was prepared to inflict "fire and fury" against North Korea if they failed to cease nuclear testing and threats. In response, North Korea issued a series of threats against the U.S. territory of Guam as well as allies such as Japan and South Korea. Two missiles were flown over Japanese territory and a nuclear test was conducted. In a speech to the United Nations General Assembly in September 2017, Trump threatened to "totally destroy" North Korea if the United States were "forced to defend itself or its allies"; he repeated his recent nickname for Kim Jong-un as "Rocket Man". In response North Korean leader Kim Jong-un called the speech "unprecedented rude nonsense" and "mentally deranged behaviour". On September 23, 2017, the U.S. Military flew B-1B bombers from Guam, along with F-15C Eagle fighter escorts from Okinawa, Japan flew in international airspace over waters east of North Korea. Unlike on previous missions, the U.S. aircraft were not accompanied by South Korean or Japanese planes. Afterward North Korea said a missile strike against the U.S. is "inevitable all the more". On September 30, 2017, U.S. Secretary of State Rex Tillerson said the U.S. and North Korea were in "direct contact", and "probing" the possibility of talks. On October 9, 2017, US Air Force B-1 bombers carried out mock missile launches off both coasts of South Korea. Two bombers operating out of Andersen Air Force Base in Guam carried out the drills along with fighter jets from the South Korean and Japan militaries. This was the first nighttime B-1 bomber exercise between the three allies. On November 28, 2017 North Korea fired an intercontinental ballistic missile and it was the first such launch from the rogue regime in more than two months. The missile, believed to be an ICBM by the U.S. Military, was launched from Sain Ni, North Korea and flew roughly 620 miles before landing in the Sea of Japan. On March 8, 2018, following a meeting with President Trump, South Korean diplomat Chung Eui-yong revealed that Kim Jong-un had expressed "eagerness" to meet with the President, and that his offer had been accepted, with a meeting proposed to take place before May. The move was described by South Korean President Moon Jae-in as a "miracle." The meeting had been scheduled to be held on June 12th in Singapore, although after military exercises between the United States and South Korea, Kim Jong-un threatened to pull out of the summit, and on May 24 President Trump cancelled it. On June 1, 2018, Trump announced that the summit was "back on" for June 12 in Singapore after meeting with North Korean officials at the White House. President Trump met with Chairman Kim on June 12. During the meeting, a historic agreement was signed between the two countries calling for North Korea to reaffirm its commitment to the 2017 Panmunjom Declaration signed between North and South Korean to work towards completely denuclearizing the entire Korean Peninsula. The agreement declared a new start to US-DPRK relations between the two countries to achieve "peace and prosperity" through cooperation on issues such as the recovery of POW/MIA remains. Trump subsequently announced that war game exercises between the US and South Korean militaries would end. Thousands of U.S. military personnel went missing during the Korean war. Between 1990 and 2018, North Korea returned the remains of 340 soldiers, but about 7,700 bodies were still unaccounted for. The June 12, 2018 summit between the US and North Korea included a vague agreement to begin repatriating American POW/MIA remains. One month later, North Korea returned 55 boxes to the US. Generally, these remains consisted of bone fragments and they were accompanied by the military identification tag of only one person, so the remains have proved difficult to identify. On June 24, Trump stated that North Korea still posed an 'extraordinary threat' to the US and maintained sanctions on the country despite declaring them no longer a threat the day following the summit. Secretary of State Mike Pompeo's first visit to North Korea in July 2018 invoked disgruntled remarks from Pyongyang that the Trump Administration was using "unilateral and gangster-like demand for denuclearization". Pompeo maintained that the July talks were "productive". However, the UN's nuclear agency (IAEA) has since stated North Korea is continuing with their nuclear program, and Trump announced the cancellation of Secretary of State Pompeo's scheduled visit in August 2018 to North Korea due to insufficient progress in the dismantling of North Korea's nuclear weapons program. Interactions between the Washington and Pyongyang continue to fluctuate following the September 2018 United Nations General Assembly. In his speech, President Trump commended Kim Jong-Un for ceasing nuclear testing, dismantling several military facilities, releasing American hostages, and returning POW/MIA remains. Trump reaffirmed that sanctions will continue to be held on North Korea until denuclearization occurs. On February 22, 2019 around 3 pm a group of 10 persons carrying real or simulated weapons entered the North Korean embassy in Madrid, Spain. They rounded up the eight embassy staffers who were present, put bags on their heads, tied them up, beat several of them and interrogated them. They robbed mobile phones and computer drives. The assault lasted for two hours, until Spanish policemen entered the building and the attackers fled in two of the embassy's cars. On March 13, the Spanish police and intelligence services identified two of the attackers as CIA operatives. The CIA denied any involvement. The 2019 North Korea–United States Hanoi Summit or DPRK–USA Hanoi Summit was a two-day summit meeting between North Korean Supreme Leader Kim Jong-un and U.S. President Donald Trump, held in Vietnam on February 27–28, 2019. The leaders had intended to hold a signing ceremony on February 28, but the summit ended without a signed agreement. North Korea immediately resumed rebuilding its long-range rockets at its Sohae Launch Facility. It was the second meeting between leaders of the North Korea and United States. It had been planned since the previous September, and its location and date was announced during Trump's third State of the Union on February 5, 2019. After the summit, Trump said he believed North Korean leader Kim Jong Un's denial of personal knowledge about Otto Warmbier's treatment in North Korean custody. Trump argued that it was not to Kim's benefit to allow such abuse. From January 1958 through 1991, the United States held nuclear weapons due to its diplomatic and military influence in South Korea for possible use against North Korea, peaking in number at some 950 warheads in 1967. Reports establish that these have since been removed but it has never confirmed by any independent 3rd party organization such as IAEA. The U.S. still maintains "the continuation of the extended deterrent offered by the U.S. nuclear umbrella". In September 1956, the U.S. Chairman of the Joint Chiefs of Staff Admiral Radford told the U.S. Department of State that the U.S. military intention was to introduce atomic weapons into South Korea. In January 1957, the U.S. National Security Council began consideration of this proposal upon President Eisenhower's instruction, and then agreed to this. However, paragraph 13(d) of the Korean Armistice Agreement mandated that both sides should not introduce new types of weapons into South Korea, so preventing the introduction of nuclear weapons and missiles. The U.S. decided to unilaterally abrogate paragraph 13(d), breaking the Armistice Agreement, despite concerns by United Nations allies. At a June 21, 1957 meeting of the Military Armistice Commission the U.S. informed the North Korean representatives that the U.N. Command no longer considered itself bound by paragraph 13(d) of the armistice. In August 1957, NSC 5702/2 permitting the deployment of nuclear weapons in Korea was approved. In January 1958 nuclear armed Honest John missiles and 280mm atomic cannons were deployed to South Korea, a year later adding nuclear-armed Matador cruise missiles with the range to reach China and the Soviet Union. North Korea denounced the abrogation of paragraph 13(d) as an attempt to wreck the armistice agreement and turn Korea into a U.S. atomic warfare zone. At the U.N. General Assembly in November 1957, the Soviet Union and Czechoslovakia condemned the decision of the United Nations Command to introduce nuclear weapons into Korea. North Korea responded militarily by digging massive underground fortifications, and forwarded deployment of its conventional forces for a possible counterattack against the United States forces stationed in South Korea. In 1963, North Korea asked the Soviet Union for help in developing nuclear weapons, but was refused. However, instead the Soviet Union agreed to help North Korea develop a peaceful nuclear energy program, including the training of nuclear scientists. China later, after its nuclear tests, similarly rejected North Korean requests for help with developing nuclear weapons. North Korea joined the Nuclear Non-Proliferation Treaty (NPT) as a non-nuclear weapons state in 1985, and North and South Korean talks begun in 1990 resulted in a 1992 Denuclearization Statement. However, US intelligence photos in early 1993 led the International Atomic Energy Agency (IAEA) to demand special inspection of the North's nuclear facilities, which prompted Kim Il Sung's March 1993 announcement of North Korea's withdrawal from the NPT. UN Security Council resolution 825 from May 11, 1993, urged North Korea to cooperate with the IAEA and to implement the 1992 North-South Denuclearization Statement. It also urged all member states to encourage North Korea to respond positively to this resolution and to facilitate a solution of the nuclear issue. U.S.–North Korea talks began in June 1993 but with lack of progress in developing and implementing an agreement, North Koreans unloaded the core of a major nuclear reactor, which could have provided enough raw material for several nuclear weapons. With tensions high, Kim Il Sung invited former U.S. President Jimmy Carter to act as an intermediary. Carter accepted the invitation, but could only act as a private citizen not a government representative. Carter managed to bring the two states to the negotiating table, with Assistant Secretary of State for Political-Military Affairs Robert Gallucci representing the United States and North Korean Vice Foreign Minister Kang Sok Ju representing his country. Both sides agreed to work together to strengthen the international nuclear non-proliferation regime. Historians Paul Lauren, Gordon Craig, and Alexander George point out that the agreement suffered from a number of weaknesses. There was no specific schedule made for reciprocal moves, and the United States was granted a very long time to fulfill its obligations to replace the dangerous graphite-moderated reactors with LWRs. Furthermore, no organization was chosen "to monitor compliance, to supervise implementation ... or to make mid-course adjustments that might become necessary." Finally, other interested nations, like South Korea, China, and Japan, were not included in the negotiations. Soon after the agreement was signed, U.S. Congress control changed to the Republican Party, who did not support the agreement. Some Republican Senators were strongly against the agreement, regarding it as appeasement. In accordance with the terms of the Agreed Framework, North Korea decided to freeze its nuclear program and cooperate with United States and IAEA verification efforts, and in January 1995 the U.S. eased economic sanctions against North Korea. Initially U.S. Department of Defense emergency funds not under Congress control were used to fund the transitional oil supplies under the agreement, together with international funding. From 1996 Congress provided funding, though not always sufficient amounts. Consequently, some of the agreed transitional oil supplies were delivered late. KEDO's first director, Stephen W. Bosworth, later commented "The Agreed Framework was a political orphan within two weeks after its signature". In January 1995, as called for in the Agreed Framework, the United States and North Korea negotiated a method to safely store the spent fuel from the five-megawatt reactor. According to this method, U.S. and North Korean operators would work together to can the spent fuel and store the canisters in the spent fuel pond. Actual canning began in 1995. In April 2000, canning of all accessible spent fuel rods and rod fragments was declared complete. North Korea agreed to accept the decisions of KEDO, the financier and supplier of the LWRs, with respect to provision of the reactors. International funding for the LWR replacement power plants had to be sought. Formal invitations to bid were not issued until 1998, by which time the delays were infuriating North Korea. In May 1998, North Korea warned it would restart nuclear research if the U.S. could not install the LWR. KEDO subsequently identified Sinpo as the LWR project site, and a formal ground breaking was held on the site on August 21, 1997. In December 1999, KEDO and the (South) Korea Electric Power Corporation (KEPCO) signed the Turnkey Contract (TKC), permitting full scale construction of the LWRs, but significant spending on the LWR project did not commence until 2000. 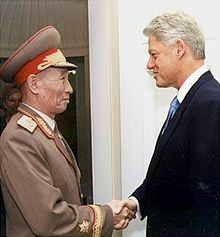 Vice Marshal Jo Myong-rok meets Bill Clinton at the White House, October 2000. In 1998, the United States identified an underground site in Kumchang-ni, which it suspected of being nuclear-related following a Defense Intelligence Agency assessment. In March 1999, North Korea agreed to grant the U.S. "satisfactory access" to the site. The U.S. inspection in spring 1999 showed that the Defense Intelligence Agency assessment was wrong. In October 2000, during Special Envoy Jo Myong Rok's visit to Washington, and after two visits to the site by teams of U.S. experts, the U.S. announced in a Joint Communiqué with North Korea that U.S. concerns about the site had been resolved. As called for in Dr. William Perry's official review of U.S. policy toward North Korea, the United States and North Korea launched new negotiations in May 2000 called the Agreed Framework Implementation Talks. George W. Bush announced his opposition to the Agreed Framework during his presidential candidacy. Following his inauguration in January 2001, the new administration began a review of its policy toward North Korea. At the conclusion of that review, the administration announced on June 6, 2001, that it had decided to pursue continued dialogue with North Korea on the full range of issues of concern to the administration, including North Korea's conventional force posture, missile development and export programs, human rights practices, and humanitarian issues. As of that time, the Light Water Reactors (LWRs) promised in the Agreed Framework had not been delivered. The two reactors were finally supplied by the Swiss-based company ABB in 2000 in a $200 million deal. The ABB contract was to deliver equipment and services for two nuclear power stations at Kumho, on North Korea's east coast. Donald Rumsfeld, the US secretary of defense, was on the board of ABB when it won this deal, but a Pentagon spokeswoman, Victoria Clarke, said that Rumsfeld does not recall it being brought before the board at any time. Construction of these reactors was eventually suspended. In 2002 the US Government announced that it would release $95m to North Korea as part of the Agreed Framework. In releasing the funding, President George W Bush waived the Framework's requirement that North Korea allow inspectors to ensure it has not hidden away any weapons-grade plutonium from the original reactors. President Bush argued that the decision was "vital to the national security interests of the United States". In 2002, the administration asserted that North Korea was developing a uranium enrichment program for nuclear weapons purposes. American-DPRK tensions mounted when Bush categorized North Korea as part of the "Axis of Evil" in his 2002 State of the Union address. When U.S.-DPRK direct dialogue resumed in October 2002, this uranium-enrichment program was high on the U.S. agenda. North Korean officials acknowledged to a U.S. delegation, headed by Assistant Secretary of State for East Asian and Pacific Affairs James A. Kelly, the existence of the uranium enrichment program. Such a program violated North Korea's obligations under the NPT and its commitments in the 1992 North-South Denuclearization Declaration and the 1994 Agreed Framework. The U.S. side stated that North Korea would have to terminate the program before any further progress could be made in U.S.-DPRK relations. The U.S. side also claimed that if this program was verifiably eliminated, the U.S. would be prepared to work with DPRK on the development of a fundamentally new relationship. In November 2002, the members of KEDO agreed to suspend heavy fuel oil shipments to North Korea pending a resolution of the nuclear dispute. Following Kim Jong-il's death on December 17, 2011, his son Kim Jong-un inherited the regime. The latter announced on February 29, 2012, that North Korea will freeze nuclear tests, long-range missile launches, and uranium enrichment at its Yongbyon plant. In addition, the new leader invited international nuclear inspectors who were ejected in 2009. The Obama administration responded by offering 240,000 tonnes of food, chiefly in the form of biscuits. This indicated a softening of the west regarding North Korea's insistence that food aid must comprise grains. In late 2002 and early 2003, North Korea terminated the freeze on its existing plutonium-based nuclear facilities, expelled IAEA inspectors and removed seals and monitoring equipment, quit the NPT, and resumed reprocessing of spent nuclear fuel to extract plutonium for weapons purposes. North Korea subsequently announced that it was taking these steps to provide itself with a deterrent force in the face of U.S. threats and the U.S.'s "hostile policy". Beginning in mid-2003, the North repeatedly claimed to have completed reprocessing of the spent fuel rods previously frozen at Yongbyon and lain cooperation with North Korea's neighbors, who have also expressed concern over the threat to regional stability and security they believe it poses. The Bush Administration's stated goal is the complete, verifiable, and irreversible elimination of North Korea's nuclear weapons program. North Korea's neighbors have joined the United States in supporting a nuclear weapons-free Korean Peninsula. U.S. actions, however, had been much more hostile to normalized relations with North Korea, and the administration continued to suggest regime change as a primary goal. The Bush Administration had consistently resisted two-party talks with the DPRK. A September 2005 agreement took place only after the Chinese government threatened to publicly accuse the U.S. of refusal to engage in negotiations. In early 2003, multilateral talks were proposed to be held among the six most relevant parties aimed at reaching a settlement through diplomatic means. North Korea initially opposed such a process, maintaining that the nuclear dispute was purely a bilateral matter between themselves and the United States. However, under pressure from its neighbors and with the active involvement of China, North Korea agreed to preliminary three-party talks with China and the United States in Beijing in April 2003. After this meeting, North Korea then agreed to six-party talks, between the United States, North Korea, South Korea, China, Japan, and Russia. The first round of talks were held in August 2003, with subsequent rounds being held at regular intervals. After 13 months of freezing talks between the fifth round's first and second phases, North Korea returned to the talks. This behavior was in retaliation for the US's action of freezing offshore North Korean bank accounts in Macau. In early 2005, the US government told its East Asia allies that Pyongyang had exported nuclear material to Libya. This backfired when Asian allies discovered that the US government had concealed the involvement of Pakistan; a key U.S. ally was the weapon's middle man. In March 2005, Condoleezza Rice had to travel to East Asia in an effort to repair the damage. The third phase of the fifth round of talks held on February 8, 2007, concluded with a landmark action-for-action agreement. Goodwill by all sides has led to the US unfreezing all of the North Korean assets on March 19, 2007. As of October 11, 2008, North Korea has agreed to all U.S. nuclear inspection demands and the Bush Administration responded by removing North Korea from a terrorism blacklist despite the American government threatening to end negotiations. Starting in late August 2008, North Korea allegedly resumed its nuclear activities at the Yongbyon nuclear facility, apparently moving equipment and nuclear supplies back onto the facility grounds. Since then, North Korean activity at the facility has steadily increased, with North Korea threatening Yongbyon's possible reactivation. North Korea has argued that the U.S. has failed to fulfill its promises in the disarmament process, having not removed the country from its "State Sponsors of Terrorism" list or sent the promised aid to the country. The U.S. has recently stated that it will not remove the North from its list until it has affirmed that North Korea will push forward with its continued disarmament. North Korea has since barred IAEA inspectors from the Yongbyon site, and the South has claimed that the North is pushing for the manufacture of a nuclear warhead. The North has recently conducted tests on short-range missiles. The U.S. is encouraging the resumption of six-party talks. On October 11, 2008, the U.S. and North Korea secured an agreement in which North Korea agreed to resume disarmament of its nuclear program and once again allowed inspectors to conduct forensic tests of its available nuclear materials. The North also agreed to provide full details on its long-rumored uranium program. These latest developments culminated in North Korea's long-awaited removal from America's "State Sponsors of Terrorism" list on the same day. U.S. intelligence agencies confirmed that a test occurred. Tony Snow, President George W. Bush’s White House Press Secretary, said that the United States would go to the United Nations to determine "what our next steps should be in response to this very serious step." On Monday, October 9, 2006, President Bush stated in a televised speech that such a claim of a test is a "provocative act" and the U.S. condemns such acts. President Bush stated that the United States is "committed to diplomacy" but will "continue to protect America and America's interests." The Six-Party Talks, below, resulted. On May 25, 2009, American-North Korean relations further deteriorated when North Korea conducted yet another nuclear test, the first since the 2006 test. The test was once again conducted underground and exploded with a yield comparable to the Little Boy and Fat Man bombs that destroyed Hiroshima and Nagasaki, respectively. The United States reacted favorably to China and Russia's reactions, who condemned North Korea's actions even though they are both strong allies of North Korea. The U.S., along with all other members of the stalled six-party talks, strongly condemned the test and said that North Korea would "pay a price for its actions." The U.S. also strongly condemned the subsequent series of short-range missile tests that have followed the detonation. On January 24, 2013, officials in North Korea openly stated that they intended to plan out a third nuclear test. A written statement from the National Defence Commission of North Korea stated "a nuclear test of higher level will target against the U.S., the sworn enemy of the Korean people." The United States intelligence community believes that, as of January 2013, North Korea has the capability to target Hawaii with its current technology and resources, and could reach the contiguous United States within three years. The White House has declared the Korean statement as "needlessly provocative" and that "further provocations would only increase Pyongyang’s isolation." Analysis of satellite photos done by the U.S.-Korea Institute at Johns Hopkins School of Advanced International Studies of the Punggye-ri nuclear test site indicates that North Korea was readying for nuclear tests at the same time it issued the threat. Later statements by North Korea included direct threats against South Korea as well, stating that North Korea "will take strong physical counter-measures against" the South in response to UN sanctions against the North. A Gallup poll that was done in 2013 revealed that, "Americans (55%) said the U.S. should defend South Korea if it was attacked by its northern neighbor, while about a third (34%) said it should not." On February 12, 2013, North Korea conducted a third nuclear test. On January 6, 2016, North Korea conducted a fourth nuclear test. North Korean officials also announced that North Korean scientists have miniaturized nuclear weapons. In February 2016, President Barack Obama enacted the North Korea Sanctions and Policy Enhancement Act of 2016, which passed the House of Representatives and the Senate with nearly unanimous support. The Inquisitr reported: "In February, President Obama hit North Korea with a round of congressionally approved sanctions that severely limits the growth of the North Korean economy, a move that China criticized, stating that the sanctions could cripple North Korea’s economy." The Trump administration sounded the alarm about the development by North Korea of nuclear weapons and missiles that could hit the United States. It tried to enlist support from Russia and China, as well as South Korea and Japan. North Korea conducted a sixth nuclear test, the first of a thermonuclear weapon, on September 3, 2017. In December 2017, former Chairman of the Joint Chiefs of Staff Michael Mullen said during an interview with Martha Raddatz on ABC's This Week that the United States did not solve diplomatically, and warned that North Korea was closer to a Nuclear War with United States. He said in a statement, "We're actually closer, in my view, to a nuclear war with North Korea and in that region than we have ever been"
On March 8, the White House confirmed that President Trump would accept an invitation to meet with Kim Jong-un within the next several months. Press Secretary Sarah Sanders said that "in the meantime, all sanctions and maximum pressure must remain." A meeting was planned. On May 24, President Trump announced he was canceling the meeting, but he reversed his cancellation on June 1. The summit was then held in Singapore as planned on June 12. On September 25, President Trump reported to the UN General Assembly that North Korea had stopped its nuclear testing but that the US would keep sanctions in place until North Korea had achieved total denuclearization. On December 20, North Korea announced that it would not denuclearize until the US meets certain demands. North Korea blamed the US for misrepresenting what had been agreed upon in Singapore. The new statement suggested that North Korea wanted a reduction in the 28,500 U.S. troops who are currently stationed in South Korea with nuclear capability; as the statement put it, "the accurate meaning of the denuclearization of the Korean Peninsula" relates to questions of "geography." Since Donald Trump's inauguration, he and North Korean leader Kim Jong-un have exchanged insults on numerous occasions. President Trump often takes to Twitter to talk about Kim Jong-un and the current North Korea situation. The situation has seriously elevated, worrying many Americans. A vast majority of Americans (70%) think that North Korea poses a serious threat to the United States, while 14% of Americans think it is no threat at all. Many Americans have shown doubt and sometimes outright opposition to President Trump during the crisis. A plurality of Americans think President Trump lacks the responsibility to handle the current North Korea situation. Americans have more trust in U.S. military leaders than they do in President Trump to handle the current North Korea situation. Still, many Americans seem to be unsure on who they are more comfortable with handling the situation. Americans are still hesitant of military action, as a majority of Americans still oppose preemptive military intervention. Top people within the military and government see this situation escalating to military action, while some still have hope that peace is possible. Still, the U.S. continues to impose sanctions on North Korea. Q: How much do you trust Donald Trump to act responsibly in handling the situation involving North Korea – a great deal, a good amount, just some or not at all? Q: How much do you trust North Korean leader Kim Jong-un to act responsibly in handling the situation involving North Korea – a great deal, a good amount, just some or not at all? Q: How much do you trust U.S. military leaders to act responsibly in handling the situation involving North Korea – a great deal, a good amount, just some or not at all? Q: To try to get North Korea to give up its nuclear weapons, would you support or oppose the U.S. offering North Korea financial incentives such as aid money, or more trade? Q: To try to get North Korea to give up its nuclear weapons, would you support or oppose the U.S. bombing North Korean military targets? Q: To try to get North Korea to give up its nuclear weapons, would you support or oppose the U.S. agreeing to stop conducting U.S. military exercises with South Korea? Q: In general, should the U.S. (launch a military strike on North Korea first, before it can attack America or U.S. allies) or should the U.S. (only attack North Korea if it attacks America or U.S. allies)? However, although Americans are inclined to defensive and or pacifist positions against North Korea, the Global Attitudes Survey conducted by the Pew Research Center in the spring of 2017 suggests how a majority of Americans (64%) expects U.S. military intervention if one of its Pacific allies (particularly Japan and South Korea) were to come into military conflict with North Korea. In contrast, the survey points to how 30% of Americans are opposed to such interventionism. In both a parallel and comparative perspective, a majority of South Korean and Japanese citizens (91% and 82% respectively) also expect U.S. military intervention if their country was attacked by North Korea. ^ "In Focus: North Korea's Nuclear Threats". April 16, 2013. Retrieved April 16, 2013. ^ "North Korea threatens to strike without warning". April 15, 2013. Retrieved April 16, 2013. ^ "North Korea threatens South with "final destruction"". February 19, 2013. Retrieved April 16, 2013. ^ "The Embassy". SwedenAbroad. Retrieved February 26, 2018. ^ "US says Swedish ambassador visits American journalists jailed in NKorea". Los Angeles Times. Associated Press. June 23, 2009. ^ Haggard, Stephen. "Public Opinion on North Korea from the Chicago Council on Global Affairs: No Evidence of Decoupling". Peterson Instritute. ^ a b Richardson, Matt (March 8, 2018). "Trump will accept Kim Jong Un's invitation to meet, White House says". Fox News. Retrieved March 9, 2018. ^ Samuels, Brett (May 15, 2018). "North Korea warns US it could pull out of planned summit with Trump". The Hill. Retrieved May 15, 2018. ^ Landler, Mark (June 11, 2018). "Trump and Kim See New Chapter for Nations After Summit". The New York Times. Retrieved June 12, 2018. ^ González, Miguel; Dolz, Patricia Ortega (March 13, 2019). "Policía y CNI vinculan con la CIA a dos asaltantes a la Embajada norcoreana en Madrid". El País (in Spanish). ISSN 1134-6582. Retrieved March 13, 2019. ^ "US to ease North Korea sanctions". BBC. June 26, 2008. Retrieved October 12, 2009. ^ Crabtree, Steve. "The Gallup Brain: Americans and the Korean War". Gallup News. ^ Friedman, Herbert A. "The Cold War in Korea – Operation Jilli". Retrieved May 8, 2013. ^ Gawthorpe, The Ford Administration and Security Policy, p. 711. ^ Gawthorpe, The Ford Administration and Security Policy, pp. 710–14. ^ President Bush's Speech on North Korea, June 2008 – Council on Foreign Relations Archived September 15, 2009, at the Wayback Machine. Cfr.org. Retrieved on December 16, 2015. ^ a b Carpenter, Ted Galen. "The 1994 North Korea Crisis: Military Force a Bad Idea Then (and a Worse One Now)". The National Interest. Retrieved June 1, 2018. ^ Robert A Wampler, ed. (December 8, 2017). "Engaging North Korea II: Evidence from the Clinton Administration". National Security Archive. Retrieved July 9, 2018. ^ "CNN – Washington was on brink of war with North Korea 5 years ago – October 4, 1999". edition.cnn.com. Retrieved June 1, 2018. ^ and, Andrew Pollack. "North Koreans Free U.S. Pilot Held 13 Days". Retrieved June 1, 2018. ^ Mihm, Stephen (July 23, 2006). "No Ordinary Counterfeit". New York Times. Retrieved September 11, 2016. ^ "Macao bank cuts ties with N Korea". Financial Times. February 17, 2006. Retrieved September 11, 2016. ^ "Laundering charge hits Macau Bank". BBC News. September 19, 2005. Retrieved December 16, 2015. ^ "Accounting firm finds no evidence of money laundering". The Agonist. March 3, 2007. Archived from the original on September 19, 2016. Retrieved September 11, 2016. ^ Suzy Kim and John Feffer, "Hardliners Target Détente with North Korea Archived October 12, 2009, at the Wayback Machine," Foreign Policy in Focus, February 11, 2008, accessed February 13, 2008. ^ "Initial Actions for the Implementation of the Joint Statement". Ministry of Foreign Affairs of the People's Republic of China website. February 13, 2007. Retrieved February 13, 2007. ^ "Rice hails N Korea nuclear deal". BBC News. February 13, 2007. Retrieved February 13, 2007. ^ Scanlon, Charles (February 13, 2007). "The end of a long confrontation?". BBC News. Retrieved February 13, 2007. ^ Lim, Jeongsub. "Frame Flow between Government and the News Media and its Effects on the Public: Framing of North Korea". Oxford Academic. ^ Daily NK – Well-trained North Korean Crew Members Knock Down Pirates. Dailynk.com (November 2, 2007). Retrieved on 2015-12-16. ^ Purefoy, Christian (October 30, 2007). "Crew wins deadly pirate battle off Somalia". CNN. ^ U.S. Navy challenges pirates off Somalia – Africa – MSNBC.com. MSNBC. Retrieved on December 16, 2015. ^ NK Nuclear Disablement on Pace: Rice. Koreatimes.co.kr (November 2007). Retrieved on December 16, 2015. ^ "DPRK seeks gain in orchestra visit". Yomiuri Shimbun. February 28, 2008. Archived from the original on March 2, 2008. Retrieved February 28, 2008. ^ a b "North Korean officials postpone warship talks with US". BBC News. July 13, 2010. Retrieved July 13, 2010. ^ Nuland, Victoria (March 16, 2012). "North Korean Announcement of Missile Launch". U.S. Department of State. Archived from the original on July 4, 2017. Retrieved June 24, 2017. ^ "North Korean missiles: Two steps back". The Economist. March 17, 2012. ^ Eckert, Paul (March 29, 2012). "U.S. suspends food aid to North Korea over missile plan". Reuters. Retrieved March 30, 2012. ^ a b c "U.S. Officials Made Secret Visit to Pyongyang in August". Chosun Ilbo. November 30, 2012. Retrieved December 1, 2012. ^ MacAskill, Ewen (March 29, 2013). "US warns North Korea of increased isolation if threats escalate further". The Guardian. Retrieved April 3, 2013. ^ France–Presse, Agence (March 28, 2013). "US flies stealth bombers over South Korea". GlobalPost. Archived from the original on April 3, 2013. Retrieved April 3, 2013. ^ Ewen MacAskill, Justin McCurry (April 3, 2013). "North Korea nuclear threats prompt US missile battery deployment to Guam". The Guardian. Retrieved April 3, 2013. ^ "Nuclear North Korea unacceptable, Kerry says". ^ DeLuca, Matthew. "John Kerry in Seoul: North Korea missile launch would be 'huge mistake'". ^ Mullen, Jethro. "North Korea outlines exacting terms for talks with U.S., South Korea". CNN.com. Retrieved April 18, 2013. ^ SANG-HUN, CHOE. "North Korea Sets Conditions for Return to Talks". The New York Times. Retrieved April 18, 2013. ^ "Largest ever US-South Korea military drill planned as a 'warning to Pyongyang', The Daily Telegraph, February 22, 2016. ^ "US student Otto Warmbier given hard labour in North Korea". BBC News. March 16, 2016. ^ Labott, Elise. "North Korea says it has arrested American citizen". CNN. Retrieved May 10, 2013. ^ Sang-Hun, Choe. "North Korea Imposes Term of 15 Years on American". The New York Times. Retrieved May 10, 2013. ^ Sang-Hun, Choe. "North Korea Says Prisoner Won't Be Used as Leverage". The New York Times. Retrieved May 10, 2013. ^ Schilken, Chuck. "Dennis Rodman asks buddy Kim Jong Un to release Kenneth Bae". LA Times. Retrieved May 10, 2013. ^ McDevitt, Caitlin. "Dennis Rodman: I'm doing Obama's job". Politico. Retrieved May 10, 2013. ^ Williams, Alex (May 10, 2014). "North Korea's State Owned News: "Obama is a monkey"". WebProNews. Archived from the original on May 13, 2014. Retrieved May 12, 2014. ^ "Americans detained in North Korea speak to CNN, ask for U.S. help". CNN. Retrieved September 12, 2014. ^ "H.R. 1771 – Summary". United States Congress. Retrieved July 29, 2014. ^ Aidan Foster-Carter (January 27, 2015). "Obama Comes Out as an NK Collapsist". 38 North. U.S.-Korea Institute, Johns Hopkins University School of Advanced International Studies. Retrieved February 6, 2015. ^ Talmadge, Eric (July 30, 2016). "U.S. has 'crossed the red line' and declared war by sanctioning Kim Jong Un, North Korea says". National Post. Retrieved July 30, 2016. ^ Lamothe, Dan; Ryan, Missy; Gibbons-Neff, Thomas (April 6, 2017). "U.S. strikes Syrian military airfield in first direct assault on Bashar al-Assad's government". The Washington Post. Retrieved April 7, 2017. ^ a b "North Korea missiles: US warships deployed to Korean peninsula". BBC. April 9, 2017. Retrieved April 18, 2017. ^ Ryan Browne (April 8, 2017). "US aircraft carrier-led strike group headed toward Korean Peninsula". CNN. Retrieved April 18, 2017. ^ "U.S. armada heads to Korea". RT. April 13, 2017. Retrieved April 18, 2017. We are sending an armada. Very powerful," Trump told Fox. "We have submarines. Very powerful. Far more powerful than the aircraft carrier. That I can tell you. ^ a b "Aircraft carrier 3500 miles from Korea". The New York Times. April 18, 2017. Retrieved April 18, 2017. ^ Edith M. Lederer (April 17, 2017). "North Korea says it's ready to react to any mode of war desired by the US". The Boston Globe. Retrieved April 18, 2017. ^ "Donald Trump may be Bluffing over a Pre-Emptive Strike on North Korea". The Economist. January 27, 2018. ^ "South China Sea: US carrier group begins 'routine' patrols". BBC. February 19, 2017. Retrieved April 18, 2017. ^ "Trump fears 'major, major conflict' with North Korea". BBC. April 28, 2017. Retrieved April 28, 2017. ^ Torbati, Yeganeh; Lee, Se Young (July 21, 2017). "U.S. State Department to clamp ban on travel to North Korea". Reuters. Retrieved July 21, 2017. ^ Brice, Makini. Ahmann, Tim; Thomas, Susan (eds.). "U.S. to extend ban on citizens' travel to North Korea". Reuters. The ban, which went into effect on Sept. 1, 2017, had been set to expire on Friday. It will be extended through Aug. 31, 2019, the State Department said in a notice to be published in the Federal Register on Friday. ^ Sang-hun, Choe; Gladstone, Rick (March 16, 2016). "North Korea Sentences Otto Warmbier, U.S. Student, to 15 Years' Labor". The New York Times. ^ Stolberg, Sheryl Gay (June 19, 2017). "Otto Warmbier, American Student Released From North Korea, Dies". The New York Times. ^ Mullen, Jethro (June 20, 2017). "North Korea: Travel firms think twice about U.S. tourists after Otto Warmbier's death". CNN Money. ^ Bowman, Karolyn. "North Korea And Public Opinion". Forbes. ^ Warrick, Joby (August 8, 2017). "North Korea now making missile-ready nuclear weapons, U.S. analysts say". The Washington Post. Retrieved August 9, 2017. ^ Sciutto, Jim (August 9, 2017). "Trump promises North Korea 'fire and fury' over nuke threat". CNN. Retrieved August 9, 2017. ^ Bob Fredericks (August 11, 2017). "White House has quietly engaged in back-channel talks with North Korea". New York Post. Retrieved August 11, 2017. ^ Baker, Peter; Choe, Sang-Hun (August 8, 2017). "Trump Threatens 'Fire and Fury' Against North Korea if It Endangers U.S." The New York Times. Bedminster, New Jersey. Retrieved September 20, 2017. ^ "North Korea fires another missile over Japan, putting Guam within range". The Straits Times. Seoul, South Korea: Reuters, AFP, Washington Post. September 15, 2017. Retrieved September 20, 2017. ^ "Donald Trump, in first UN speech, warns US will 'totally destroy' North Korea if threatened". ABC News (Australia). September 19, 2017. Retrieved September 20, 2017. ^ Samuelson, Kate (September 22, 2017). "'Mentally Deranged.' Read Kim Jong Un's Entire Response to Donald Trump". Time. Retrieved September 29, 2017. ^ "North Korea says strike on US is 'inevitable' as Pentagon flies bombers off coast". foxnews.com. September 23, 2017. Retrieved September 23, 2017. ^ "North Korea and US 'in direct contact', says Tillerson". BBC News. September 30, 2017. Retrieved September 30, 2017. ^ "U.S. bombers conduct drills off both coasts of Korean Peninsula". Fox 61 News. October 11, 2017. Retrieved October 11, 2017. ^ "North Korea fires ICBM into Japanese waters". Fox News. November 28, 2017. Retrieved November 28, 2017. ^ Baker, Peter (March 11, 2018). "Unpredictable as ever, Trump stuns with a gamble on North Korea". The Sydney Morning Herald. Retrieved May 20, 2018. ^ Nakamura, David; Wagner, John (May 10, 2018). "Trump announces June 12 summit in Singapore with North Korean leader, U.S. prisoners released". Washington Post. ISSN 0190-8286. Retrieved May 20, 2018. ^ Samuels, Brett (May 15, 2018). "North Korea warns US it could pull out of planned summit with Trump". TheHill. Retrieved May 20, 2018. ^ a b "Trump calls off Singapore summit with North Korea". Retrieved June 1, 2018. ^ "Trump says U.S.-North Korea summit back on for June 12 in Singapore". PBS NewsHour. Retrieved June 1, 2018. ^ Rosenfeld, Everett (June 12, 2018). "Read the full text of the Trump-Kim agreement here". CNBC. Retrieved October 2, 2018. ^ Stewart, Phil; Smith, Josh (August 2, 2018). "U.S. welcomes home remains of presumed war dead from North Korea". Reuters. Retrieved January 24, 2019. ^ Lawrence, Quil (July 27, 2018). "North Korea Turns Over 55 Boxes Of Possible Remains Of U.S. Serviceman". NPR.org. Retrieved January 24, 2019. ^ Copp, Tara (September 11, 2018). "2 more service members ID'd from North Korea remains". Military Times. Retrieved January 24, 2019. ^ "N Korea returns war dead with one name tag". August 1, 2018. Retrieved January 24, 2019. ^ "North Korea erasing most anti-US propaganda". New York Post. June 23, 2018. Retrieved June 24, 2018. ^ "Trump declares North Korea 'no longer a nuclear threat'". ABC News. June 13, 2018. Retrieved June 24, 2018. ^ "N Korea still poses major threat - Trump". BBC News. June 23, 2018. Retrieved June 24, 2018. ^ "North Korea Criticizes 'Gangster-Like' U.S. Attitude After Talks With Mike Pompeo". Retrieved October 2, 2018. ^ "Trump calls off Pompeo's North Korea trip". BBC News. August 24, 2018. Retrieved October 2, 2018. ^ a b "Read Trump's speech to the UN General Assembly". Vox. Retrieved October 2, 2018. ^ Kube, Courtney; Lee, Carol; Mitchell, Andrea (March 5, 2019). "North Korea rebuilding long-range rocket site, photos show". NBC News. Retrieved March 6, 2019. ^ Ankit, Panda (September 11, 2018). "A Second Trump-Kim Summit Looks Likelier Than Ever". thediplomat. Retrieved September 28, 2018. ^ Zhenhua, Lu (September 26, 2018). "Second summit between Donald Trump and Kim Jong-un may be held 'after October'". scmp.com. Retrieved September 28, 2018. ^ Genin, Aaron (January 27, 2019). "STAGNANT CONGRESS, ACTIVE PRESIDENT: KOREAN TALKS CONTINUE". The California Review. Retrieved April 11, 2019. ^ "Otto Warmbier: Trump defends Kim over US student's death". BBC News. Retrieved March 2, 2019. ^ Hans M. Kristensen (September 28, 2005). "A history of U.S. Nuclear Weapons in South Korea". Federation of American Scientists. Retrieved January 19, 2007. ^ Jin Dae-woong (October 10, 2006). "Questions still remain over 'enhanced' nuclear umbrella". ^ a b c d Selden, Mark; So, Alvin Y (2004). War and state terrorism: the United States, Japan, and the Asia-Pacific in the long twentieth century. Rowman & Littlefield. pp. 77–80. ISBN 978-0-7425-2391-3. ^ a b Lee Jae-Bong (December 15, 2008). "U.S. Deployment of Nuclear Weapons in 1950s South Korea & North Korea's Nuclear Development: Toward Denuclearization of the Korean Peninsula (English version)". The Asia-Pacific Journal. Retrieved April 4, 2012. ^ "KOREA: The End of 13D". TIME Magazine. July 1, 1957. Retrieved April 4, 2012. ^ Statement of U.S. Policy toward Korea. National Security Council (Report). United States Department of State – Office of the Historian. August 9, 1957. NSC 5702/2. Retrieved April 17, 2012. ^ "News in Brief: Atomic Weapons to Korea". Universal International Newsreel. February 6, 1958. Retrieved April 4, 2012. ^ "'Detailed Report' Says US 'Ruptured' Denuclearization Process". Korean Central News Agency. May 12, 2003. Retrieved April 4, 2012. ^ Niksch, Larry A (March 17, 2003). North Korea's Nuclear Weapons Program (PDF) (Report). Congressional Research Service. IB91141. Retrieved September 24, 2009. ^ Clinton, William ‘Bill’ (November 10, 1999). "Presidential Letter to Congress on Weapons of Mass Destruction". Clinton foundation. Archived from the original on May 22, 2007. Retrieved March 5, 2007. ^ Wit, Joel (January 22, 2019). "Opinion: What I Learned Leading America's 1st Nuclear Inspection In North Korea". National Public Radio. Retrieved January 22, 2019. ^ Lauren, Paul; Craig, Gordon; Page, Alexander George (2007). Force and Statecraft: Diplomatic Challenges of Our Time. Oxford: Oxford University Press. ^ "Rumsfeld was on ABB board during deal with North Korea". Swissinfo.ch. February 24, 2003. Retrieved December 16, 2015. ^ "US grants N Korea nuclear funds". BBC News. April 3, 2002. ^ "North Korean nuclear progress: Leap of faith". The Economist. March 3, 2012. ^ Korea North: Energy Policy, Laws and Regulation Handbook. Washington DC, USA: International Business Publication. pp. https://books.google.co.kr/books?id=lgZierjOjYIC&pg=PA202&lpg=PA202&dq=Korea+North:+Energy+Policy, +Laws+and+Regulation+Handbook&source=bl&ots=10SXAH6UDp&sig=YCZSLeO-ggGpvGk25PZMYu1AA_E&hl=ko&sa=X&ved=0ahUKEwjx-emll7LbAhUHUrwKHcCbC7QQ6AEIKzAB#v=onepage&q=Korea%20North%3A%20Energy%20Policy%2C%20Laws%20and%20Regulation%20Handbook&f=false. ^ US removes North Korea from terrorism blacklist. Guardian. Retrieved on December 16, 2015. ^ "N Korea taken off US terror list". BBC News. October 11, 2008. Retrieved March 27, 2010. ^ "Test follows warning from U.N." Retrieved October 9, 2006. ^ "President Bush's transcript on reported nuclear test". CNN. Retrieved October 9, 2006. ^ Sanger, David E.; Choe Sang-Hun (January 24, 2013). "North Korea Issues Blunt New Threat to United States". The New York Times. Retrieved January 25, 2013. ^ Pennington, Matthew (January 25, 2013). "Images suggest NKorea ready for nuke test". Businessweek. Retrieved January 25, 2013. ^ "North Korea warn South over UN sanction". BBC. January 25, 2013. Retrieved January 26, 2013. ^ Inc., Gallup,. "Americans Viewed N. Korea Warily Long Before Trump's Warning". Gallup.com. Retrieved September 29, 2017. ^ "North Korea stages nuclear test in defiance of bans". The Guardian. February 12, 2013. Retrieved September 11, 2016. ^ Starr, Barbara; Hanna, Jason; Melvin, Don (February 2, 2016). "South Korea, Japan condemn planned North Korea satellite launch". CNN. ^ Fifield, Anna (February 22, 2016). "Punishing North Korea: A Rundown on Current Sanctions". Washington Post. Archived from the original on January 11, 2017. ^ "President Obama Responds To Warmbier Sentencing: North Korea Hit With New Sanctions". Inquisitr. March 16, 2016. ^ Ankit Panda, Vipin Narang (September 5, 2017). "Welcome to the H-Bomb Club, North Korea". The Diplomat. Retrieved September 5, 2017. ^ Michael D. Shear; David E. Sanger (November 20, 2017). "Trump Returns North Korea to List of State Sponsors of Terrorism". The New York Times. Retrieved November 21, 2017. ^ Westcott, Ben. "North Korea denounces US terror listing as a 'serious provocation'". CNN.com. CNN. Retrieved November 22, 2017. ^ Robertson, Derek (December 31, 2017). "Mullen: Threat of nuclear war with North Korea heightened". Politico. Retrieved February 26, 2018. ^ "US closer to 'nuclear war with North Korea' than ever before: Former Joint Chiefs head – ABC News". Abcnews.go.com. December 31, 2017. Retrieved February 26, 2018. ^ "The US reportedly wants a limited strike on North Korea to give Kim Jong Un a 'bloody nose'". Business Insider. December 21, 2017. ^ "US denies plan for 'bloody nose' strike on North Korea". Star Tribune. February 15, 2018. Archived from the original on February 16, 2018. Retrieved February 16, 2018. ^ "No 'bloody nose' plan for North Korea: U.S. official, senators". Reuters. February 15, 2018. ^ "Trump official denies US planning 'bloody nose' strike on North Korea". The Hill. February 15, 2018. ^ Tong-Hyung, Kim (December 20, 2018). "N. Korea says it won't denuclearize unless US removes threat". AP NEWS. Retrieved December 20, 2018. ^ a b c d e f g h i "Most Americans trust U.S. military leaders, not the president, to handle North Korea". The Washington Post. Retrieved October 20, 2017. ^ a b c "Allied expectations for using force in case of a military conflict with North Korea are in line with U.S. support". Pew Research Center. July 13, 2017. Retrieved February 11, 2018. Beal, Tim (2005). North Korea: The Struggle Against American Power. London: Pluto Press. ISBN 978-0-7453-2013-7. Jackson, Van (2016). Rival Reputations: Coercion and Credibility in US–North Korea Relations. Cambridge: Cambridge University Press. ISBN 978-1-107-13331-0. , covers 1960s to 2010. Far-Reaching U.S. Plan Impaired N. Korea Deal, Glenn Kessler, Washington Post, September 26, 2008.